You don’t realize your eyes are fooling you until you stand close to the Barn Theater at UCSC’s main entrance. That’s when you realize what looks like a digitally rendered photographic billboard of Martin Luther King Jr.’s face, for example, is not digital, photographic, or even a billboard. Peer closely and you’ll see dry-brush strokes, a dot of white paint on King’s right eye and splatters of color on the ground. They’re the telltale marks of Jim Urban, 58, the man behind every meticulously hand-rendered barn sign since 1978. While his artwork may publicize cultural events on campus, Urban himself remains one of the university’s best-kept artistic secrets. 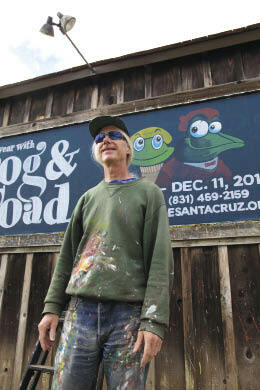 He spends two days, sometimes in the dark, rendering each piece of work with “regular cheap brushes” and industrial-strength Kelly-Moore paints, carrying out commissions on barn space that UCSC community members reserve up to a year in advance. Calm and soft-spoken, Urban follows instructions closely, trying to copy smaller versions of the pictures as faithfully as possible. And yet the results often look like magic. “Sometimes I’ll drop in shadows, halos, and other little artistic effects,” Urban said. You can see the texture on his painted straw hats. He can create accurate human flesh tones, or can make his artwork photorealistic or cartoonish depending on the assignment. But why would UCSC use such a low-tech, ultra-analog method to get the word out about its events? There is only one downside to this throwback approach. Once Urban paints over his original artwork, it’s gone forever. Fortunately, he’s taken many souvenir snapshots over the years. “Sometimes I’ll like a sunset, a face or a logo and take a picture of that,” he said. Meanwhile, his old artwork, for at least the past 10 years since the barn’s walls were resurfaced, has been accumulating, layer after layer. According to his best guess, there are more than 100 murals piling up in micro-thin strata on that barn wall. Urban has spent 34 years on the job, so far resisting newfangled approaches and never using an airbrush.